Little Botanical / Competition / Do you love Christmas as much as we do? Do you love Christmas as much as we do? Do you love Christmas as much as we do? We are counting down the days until we can put the Christmas tree up. There is a bit of an unwritten rule in our house… no tree until December! So instead I’m slowly sneaking in Christmas by adding in a few of our Christmas plants. Among the mayhem of writing lists for Christmas and the general run-up to the end of term madness of Christmas plays and School Fayre’s, I’m loving creating a cosy corner with a fluffy blanket, a few new scented candles and of course some festive plants. 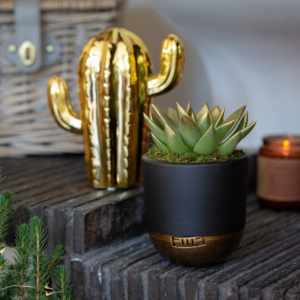 Have you seen how cute our mini gold dipped succulents are? 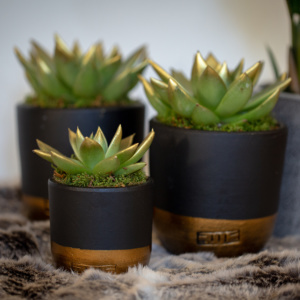 They come in both mini and medium sizes so perfect for creating a little Christmas plant gang or low maintenance table decoration. 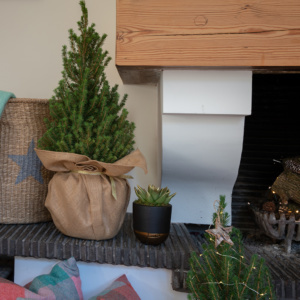 For those who want something a little more traditional, our beautiful miniature decorated Christmas trees are the perfect low maintenance sideboard decoration. 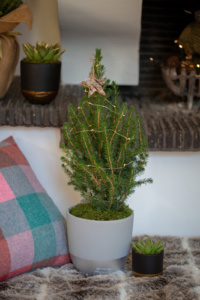 Each tree comes complete with beautiful fairy lights, a rustic wooden star decoration and all potted up in our beautiful silver dipped ceramic. It’s definitely beginning to look a little bit Christmassy without shouting it from the rooftops don’t you think. With the countdown to Christmas firmly underway, we can finally reveal that we are bringing you four amazing advent giveaways in the run up to Christmas. We have teamed up with some fabulous unique brands that we think you will fall in love with. The first of our amazing giveaways is with Tolly McRae who produce beautiful high-quality British made blankets and throws. They feel so warm and come in a variety of lovely colours and patterns. Simply perfect for those lazy winter evenings snuggled in a cosy corner. Keep an eye on our social media channels or sign-up to our newsletter for details of all our amazing Christmas collaborations throughout December. 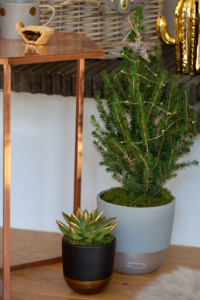 We love plant styling at all times of the year not just Christmas and we do love to see our plants in your homes. Don’t forget to tag us in your pictures!